Home » Healthcare Information Technology » Faster Delivery of Lab Test Results Achieved by Pathology, Inc. Privately owned pharmacies and laboratories are covered by HIPAA Rules, and they must therefore ensure that all Protected Health Information (PHI) stored and transmitted, is appropriately secured, with the security measures used dictated by the standards laid down in the HIPAA Security Rule. The privacy of patients must be assured at all times. Highly sensitive health information, such as medical test results, could cause patients to come to harm if accidentally disclosed to the wrong individuals. Efforts should therefore be made to ensure any transmission of data cannot be intercepted and read. To reduce the risk of HIPAA breaches, many laboratories stick to tried and tested delivery methods, and accept there will be a delay in data reaching physicians. Some companies have risen to the challenge, and now ensure faster delivery of lab test results by utilizing new technology. They have leveraged Smartphones to coordinate patient care more efficiently and ensure treatment to patients is provided more rapidly. This smart use of technology has allowed HIPAA-covered entities to improve patient outcomes and make considerable cost savings. Laboratories wishing to communicate PHI to healthcare providers must ensure the channel through which data it is sent is properly secured. Data should be encrypted in transit from end to end, which means the use of SMS messages is only possible is a data encryption service is used. Pathology Inc., recently opted to use the mobile network to communicate test results and other PHI. Physicians can now rely on getting test results quickly, and the company can offer much greater value to its clients. Pathology Inc., opted for a system that sends messages via a secure communication network with authentication controls and end to end encryption, in full accordance with HIPAA Rules. TigerConnect, a service provided by TigerText, was the preferred system. The secure message provider installed its HIPAA-compliant secure text message platform on doctors’ mobile devices and secure, encrypted messages could be sent with minimal disruption. Read and delivery receipts, message alerts, and group messages/conversations are also supported by the app. Other HIPAA covered entities have also benefited from the change to secure SMS messages to communicate PHI. 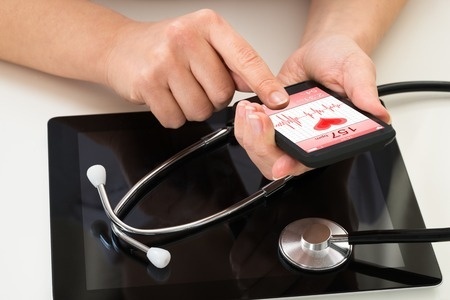 With the majority of healthcare workers now using their own devices or provider supplied units for work purposes, the use of Smartphones to improve communication issues was a natural step. TigerText case studies indicate prescriptions can be filled 50% faster, 15 or more patients can be seen per hour and workflow efficiency has been shown to be increased by 34%.